Black's Cliff is a four-season, family-oriented resort located near Minocqua, Wisconsin in Hazelhurst on Lower Kaubashine Lake. We occupy 4,000 feet of beautiful shoreline shaded by towering pines and white birch. All eleven cabins offer a lake view and are spaced to ensure privacy. 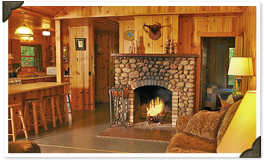 The cabins have all been newly remodeled while retaining their famed "Northwoods" charm. Black's Cliff Resort's lakeside cabins are attractively decorated, comfortable and are fully equipped for light housekeeping, with new appliances. 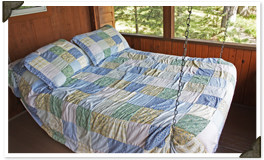 Our original swinging beds are found on each screened in porch. Black's Cliff Resort can comfortably accommodate couples looking for a relaxing getaway to families and groups. Families often reserve two or more cabins for larger groups and reunions. 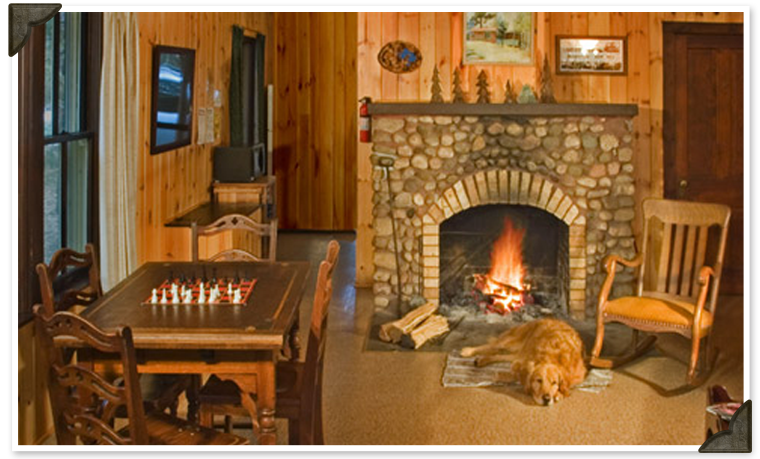 All of the cabins are heated -- ten with beautiful stone fireplaces. You will find firm beds, with plenty of pillows and warm blankets for your comfort. Free firewood is neatly stacked near each cabin. Large screened porches provide a panoramic view of the lake and are curtained for privacy and stormy weather. At Black's Cliff, everyone is welcome. The bigger the family, including the furry ones, the better! Dogs are always welcome at Black's Cliff as long as they follow a few resort rules. Please make sure to read our Pet Policy. Lower Kaubashine is a sparkling-clear, spring-fed, 200-acre lake. Black's Cliff Resort offers a sandy beach complete with a diving raft, canoes, kayaks, tubes and more. 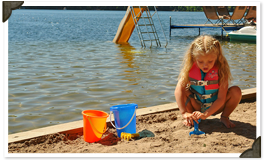 We also provide an enclosed swimming area for younger children, as well as a groomed waterfront and large piers for sunbathers. If you would like to bring your own boat, let us know in advance, so we can make sure to have a dock ready for you.